When San Diego's tourism board sits down to come up with new and different ways to attract people to their city, the community of El Cajon probably doesn't jump out at them as a logical solution. 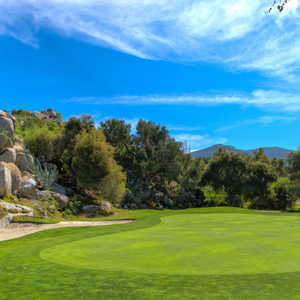 What they're missing, though, is a legitimate attraction for anyone planning a golf vacation to the San Diego area - the Singing Hills Resort and Country Club (EDITOR'S NOTE: This facility is now known as Sycuan Resort.). Granted, there are no ocean views to be seen in El Cajon, and there are probably more elegant golf courses to be found in San Diego. But with that elegance comes a price. To play the elite courses in this beautiful city, one can expect to pay anywhere from $50 to $150 per round. Sometimes even more. What Singing Hills offers is a complete golf vacation package: two great championship courses (Willow Glen and Oak Glen), one nine-hole course, an extensive practice facility and a place to lay your head at the end of the day. And the price won't kill your pocketbook. Head golf professional Mike Reinherdt and his staff at Singing Hills have created an atmosphere that welcomes golfers of all backgrounds and ability levels (Singing Hills was included in Golf for Women Magazine's Top 10 Women Friendly Golf Courses). Whether you're only there to play a round of golf, or if you're staying for the week, you can expect to be given first-class treatment from beginning to end. The practice facilities boast a driving range that can accommodate a large number of golfers, and two rather large putting greens. Even if you're not playing a round of golf, there's plenty to do at Singing Hills to give you your golfing fix for the day. 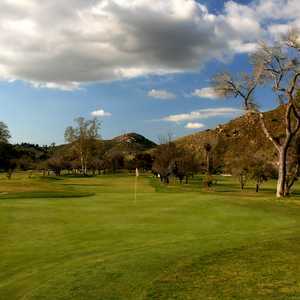 The Willow Glen course isn't an extremely long golf course (6,605 yards from the blue tees, 6,207 yards from the whites), but as with so many other San Diego golf courses, the challenge lies within the design of each individual hole. Wide open holes are few and far between, as trees line every fairway and surround almost every green. In other words, if you don't hit the ball straight, your chances of shooting a low score go out the window. Errant shots will leave your ball among the groups of trees scattered all over the course. If there isn't a tree in your way, a sand trap is a ready alternative, as bunkers wait in many landing areas. The physical condition of the course isn't perfect. On many of the tee boxes it is difficult to find adequate space from which to hit. Not all of the fairways are in the greatest condition either, but with the amount of traffic on the course, it is to be expected. But whatever flaws this course has, they do nothing to overshadow the overall enjoyable experience to be had at Singing Hills. After a beautiful opening hole, the second hole is a prime example of distance taking a back seat to design. Only 311 yards from the whites (362 from the blues), this rather short dogleg left requires nothing more than a mid-iron off the tee. Hitting anything more than that will put you in a bad position for your approach, as trees make long hitters think twice. It is extremely important to pay attention to pin placement on the second hole, and to realize your limitations when attempting an approach shot. The two-tiered green is shaped like an hourglass, and flanked by sand traps on either side. If you hit your approach on the wrong portion of the green, not only are you looking at a long putt, but you're looking at a putt that changes elevation along the way, making it nearly impossible to judge the correct speed. One of the most visually pleasing holes on the course is the par-4 fourth. Again, distance means nothing here (308 yards from the whites, 323 yards from the blues), as your driver will most likely stay in the bag on this hole. In reality, any shot going further than 180 yards from the tee will miss the landing area completely, as the elevated tee boxes give way to an extreme drop-off to the fairway. Waiting approximately 220 yards away is a rather large pond that sits in between the fairway and the green. The undulating green is also extremely large (from left to right) and it is not entirely inconceivable to walk off the green with a four-putt. It is possible to hit a driver off the tee and hope to reach the green (I am proud to say I did it) but as I learned the hard way, the green will not hold any approach shot hit with a driver. Finishing off the front nine is a rather short par-3 (159 yards from the whites, 184 from the blues). The tee shot is hit over a canal onto a narrow, elevated green. If you miss the putting surface, your ball will likely fall off the slope of the hillside, no matter which direction you hit your shot. Missing the green will most likely leave a blind second shot that has to get uphill in a hurry. Once you get on the putting surface, it shouldn't take more than two putts to get in the hole. But getting on the green is half the challenge here. The twelfth hole, another par-3 (149 yards from the whites, 169 yards from the blues), is by far the most picturesque hole on the course (the cover of the scorecard carries a photo of this spectacular hole). A multi-level pond, complete with rock formation, sits to the right side of the green. Sand traps wait to the left, ready to devour a misplaced tee shot. And a very difficult green makes up for a relative lack of distance (are we sensing a theme here?). It is once again extremely important to pay attention to the pin placement, as this multi-tiered putting surface can play games with a golf ball. Escaping with a par is quite an accomplishment here. One of the few holes that will play slightly longer than normal is the par-4 fourteenth. It isn't a monster on the scorecard (340 from the whites, 358 from the blues) but from the landing area to the green, an elevation change of at least 40 feet makes the hole play much longer. The approach shot on this hole is more or less blind, and if you misjudge the distance, you could be in deep trouble. Once you get up to the green, you find a long and narrow green, and landing your ball on the wrong part could leave you with a putt of at least 20 yards. The par-4 sixteenth is the longest par-4 on the course (393 yards from the whites, 413 yards from the blues), but overcoming the distance isn't hardly enough to score well here. There isn't much to this hole until you get to the green, and once you get there, the pin placement will determine what kind of score you can escape with. The back portion of the green is at least ten feet higher than the front, and the elevation change is anything but gradual. In other words, the back of the green acts as a backboard, and if the pin is anywhere near the back of the green, good luck in getting your ball anywhere near the hole. As you finish up your round, you will no doubt be glad to have escaped with your psyche still intact. A round on the Willow Glen Course at Singing Hills will drain you physically and emotionally, but will also please the demanding golfer that is inside all of us.